European Roulette - The best possible way to play! Although an amateur might not be able to tell the difference between the two, if you're serious about making money from playing Roulette, choosing to play European Roulette is a no-brainer. Here we take a closer look at European Roulette (or French Roulette as it is also known) and find out the best way to play. Apart from the fact that European Roulette cuts down the house edge by almost half, most European Roulette tables offer “En Prison,” a rule similar to Surrender. It shrinks the casino’s advantage even further to a mere 1.35 per cent by giving any player who loses an even-money bet due to the ball landing in the zero pocket the option of either giving up half his bet or having the whole bet held over for the next spin; if he wins the next spin, the full bet is returned to him with no additional winnings, and if he loses, the full bet is lost. That being said, the European Roulette wheel does have its tricky points. For one thing, its designers, the Blancs, were a million times the mathematicians the American wheel’s inventors were, and as a result, the standard French wheel has no contiguous number spans covered by a handful of choice propositions. In fact, the whole French number sequence is enough to baffle anyone who wants to memorize the wheel. 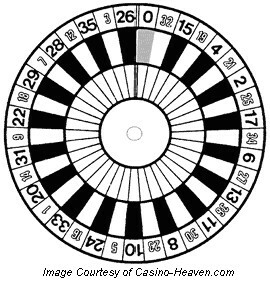 As you can see from the graphics below, the French layout looks very different from its American cousin which you can find on the American Roulette page, with several outside propositions on both sides of the mat and every nook and cranny packed with French terminology. In European casinos, players may be given the choice to put their money en prison ("in prison" in French). The en prison rule is ultimately a variant of the la partage rule (la partage being the French word for sharing). In la partage, a player loses only half of their even-odd stake if the original spin produces a zero and they recoup the other half. In European Roulette where la partage is a common variant, the player may also be offered to en prison their original stake instead. We don’t expect you to parlez-vous, but if you could, you’d discover that every one of European Roulette’s regular betting options is exactly the same as those on an American table (of course, if you want to play American Roulette at all costs, you can easily visit our Online Casinos USA page and find an American Roulette Casino to fit your needs there). The only exceptions are that American Roulette has the two special street bets we mentioned before, and European Roulette occasionally allows for a split dozens bet. Below we have made a chart of all the bets you can make, the odds that each one has and finally, and most importantly, the payoff odds of each bet. It's important that you pay close attention to the odds of each bet because while something might look like a great idea on paper, it doesn't necessarily mean that it will give you back a decent amount. The main thing about these bets is the real payoff which is why we’re going to go through this aspect step-by-step just to make sure we’re all on the same page. Basically, all you have to do is subtract the number of units lost from the number of units won, keeping the units you bet on the winning proposition on the right side of the dash. 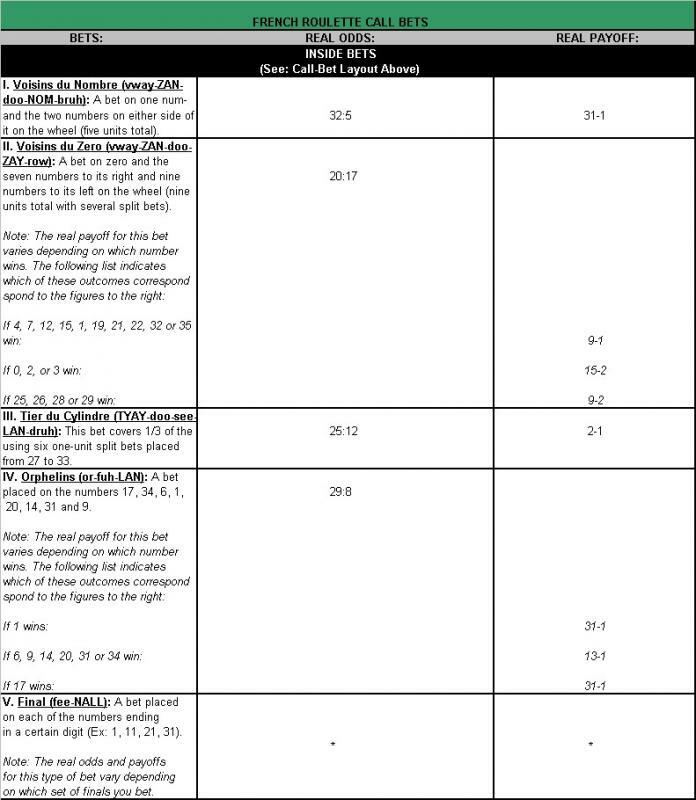 So looking at the simplest of these, Voisins du Zero, you have to bet one unit on each of the five “neighbors,” including the middle number. Now let’s say the middle number wins. You lose the units you bet on the other neighbors (four units total) and win 35 units on the middle number. 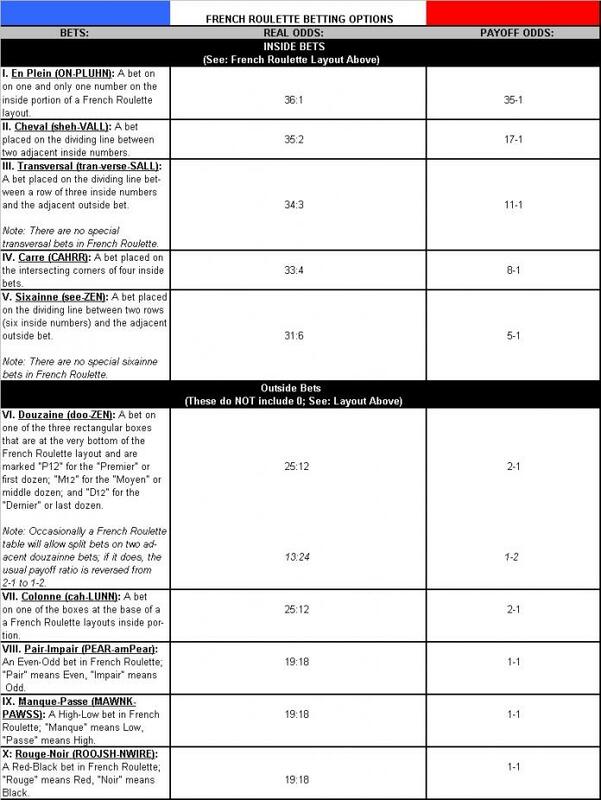 Because you’re sustaining a loss, you’re actually only winning 31 units for every one unit you bet. So the real payoff for this bet is 31:1. This is much better than a “quad” or “carre” bet in which, if you placed five units on it, would only pay 8-1 with real odds of 33:4. But it doesn’t come close to the American contiguous; whose real odds are 11:8 for a coverage area of two uninterrupted sequences of eight pockets. If you really want to work it out, the question of which contiguous is better becomes much more involved. But, contrary to what you might think, determining this is more a matter of exposure than probability. Most people mistakenly believe you can find out how far ahead you’ll get by treating an outcome’s probability as a portion of 100 bets. They reason that if they have a 50-per cent chance of winning on a coin toss and there are 100 tosses they should win 50 times. However, the probability that any set of 100 tosses would have exactly 50 heads and exactly 50 tails is only 8 per cent. Why? Because, when we’re talking percentages for an occurrence, we’re only looking at the likelihood that it will happen on one trial. The other trials—assuming they’re all made with the same equally balanced coin and that coin doesn’t incur any physical wear from being flipped—are totally separate events and are unrelated to the first event. Over time, it’s true, the number of times an outcome occurs will eventually average out to something close to its percentage probability. But that “over time” is actually a long, long time—perhaps billions and billions of flips (or spins). The best route with any game of chance, then, is to always play a single bet with the greatest coverage. This will give you a greater probability of winning on each spin, which in the end, is the best you can hope for. (-$5 x 32/37) + ($31 x 5/38)=? (-$4 x 26/38) + (-$1 x 33/38) + ($4 x 12/38) + ($2 x 5/38)=? (-$2.74) + (-$.87) + ($1.26) + ($.26)=? $1.26 + $.26 - $2.74 - $.87=? Check Yourself: Unlike American tables, checks don’t exist in European Roulette. Instead, players bet with the same casino chips they’d use at the poker and Craps tables. This might seem to make things simpler, but in fact, it can actually cause a great deal of confusion, especially when two players bet the same chip denominations on the same proposition and it wins. Team Players: American Roulette tables will generally have two casino attendants, the dealer who spins the wheel, collects the bets and handles buy-ins and cash-outs, and the “mucker” or “chipracker,” who keeps the “bank” (the casino’s side of the table) straightened, stacks the checks and helps the dealer count out payoffs. 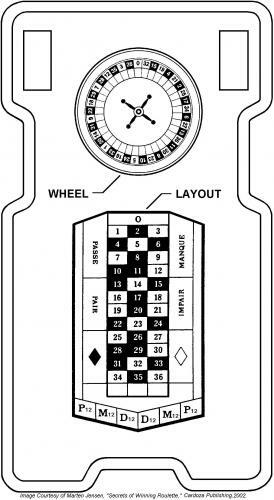 In European Roulette, the division of labor goes one step further, with three casino personnel at each wheel: A croupier, who oversees the operation, a “stick man” who clears the layout with a stick resembling a miniature shuffleboard paddle, and the “tourneur” who operates the wheel. This might seem a little excessive, but it makes a heck of a lot of sense when you consider that French Roulette dealers need to keep track of whose chips are whose. Double Trouble: European Roulette tables often have two wheels and one layout or two layouts and one wheel, with a team of attendants for each piece. No doubt, this is useful for speeding up play because roulette tends to draw a crowd in Europe. But it also makes some play strategies literally impossible. One of these is the “visual-tracking/past-posting” system, in which one player watches the wheel to determine the general area the ball will land in (visual tracking), then signals his teammate who bets on that area of the wheel after the dealer has called all bets final (past posting). Casino attendants will boot a player out the door if they catch him using the latter technique, and naturally, with five or six table operators, the chances of that happening go up big-time. Get spinning on that French Roulette Wheel! Loved the world over, Online Roulette is one of those games where your luck and a keen understanding of the game work hand in hand which is why it's important that you read our Roulette Strategy page too before you start playing for real money. Choosing to play at the wheel which will give you the best results possible should be the foundation of the strategy that you decide on. Here at GamblingPlanet, we know the importance of knowing your game of choice inside out which is why we always suggest that players read the guide, the rules and the strategy and then follow all this up with a spell in the free games section. Although many people might tell you otherwise, the more that you are able to familiarize yourself with a game, the better your chances will be of becoming a champion over time. When it comes to casino maybe more than anything else, practice does, in fact, make perfect. So, pull up a chair, take a closer look at one of our specially compiled toplists and prepare yourself for the roulette ride of a lifetime!